Today, Intel announced their next generation processor architecture known as "Sandy Bridge" (or 2nd Generation Core processor). 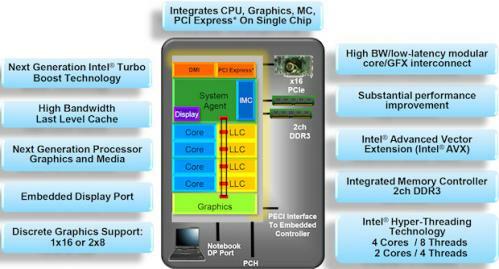 The new processors are built on the 32nm process and integrate the processor, memory controller and graphics on the same die. In particular the new integrated graphics performance is significantly improved over previous Intel's previous chips. Sandy Bridge is, essentially, a next-generation replacement for Intel's primary CPUs for desktops and laptops .... At the heart of Sandy Bridge is an essentially new processor microarchitecture, the most sweeping architectural transition from Intel since the introduction of the star-crossed Pentium 4. Nearly everything has changed, from the branch predictors through the out-of-order execution engine and into the memory subsystem. The goal: to achieve higher performance and power efficiency, even on single-threaded tasks, where the integration of multiple CPU cores hasn't been much help. Anandtech in particular notes that the new processor architecture is a major step forward for laptops, significantly closing the price/performance gap between desktops and laptops. Again, Sandy Bridge delivers playable performance in every single title at 768p and "Low" detail settings. What's more, it actually surpasses the GeForce 320M in Apple's MacBook Pro 13 in five out of six games (the exception being STALKER). Performance, however, did lag in Medium detail settings. Intel's previously poor integrated graphics performance was seen as one of the reasons why Apple has stuck with pairing of previous generation Intel processors and NVIDIA 320M GPUs. Not only do we get 50 to 100% better performance than the previous generation high-end Intel mobile chips, but we also get more than double the integrated graphics performance and battery life in most situations should be similar to Arrandale, if not better. And that's looking at the quad-core offerings! Meanwhile, dual core and low-power versions of Sandy Bridge processors are expected to arrive next month.